Why would a company advertise their business but make the decision to turn away half of the people who come to shop at their store? It's nonsensical. 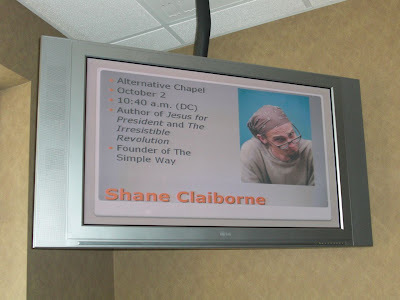 In the same fashion, why would Lee University promote the second coming of Shane Claiborne, a chapel speaker already popular among students, for a whole week before his arrival and then turn away half the crowd that came to listen to him? 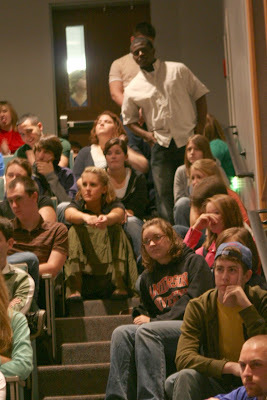 Like his first sermon on campus, Claiborne spoke in the Dixon Center on Thursday, October 2. It was a great sermon. People loved it. Students were engaged in every word. But not everyone could come. Droves, and I mean hundreds, of students were turned away from the Dixon Center doors fifteen minutes before chapel was even scheduled to start. These were students who were excited about going to chapel, students who wanted to hear Claiborne's message. And they had to go to the Conn Center. For those who did manage to get a seat in the Dixon Center, the seating was tight. A whole extra row of students sitting formed at the front of the auditorium. A whole new row of students standing formed at the back. The filming balconies were squeezed with students, the aisles were filled with students, the wings of the entrances were filled with faculty and latecomers who managed to sneak in... to hear a sermon. This is what chapel should be! The excitement was generated. The buzz was there. And people were turned away. 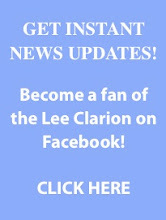 Lee University, why didn't Claiborne speak in the Conn Center? The seating would have been ample and even if it wasn't, closed-circuit could be set up in the Dixon Center. Why would you advertise a feature chapel speaker with a color picture on television screens around campus (a practice reserved for no other speaker), and then cram that speaker into the secondary auditorium? Even without advertising, Shane Claiborne still would have packed the Dixon Center full. It's a decision that I hope gets better handling next time. See pictures of Shane Claiborne speaking in chapel.